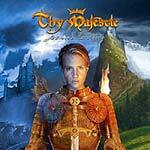 The third studio release from Italian symphonic metal division Thy Majestie has reached the market and been there for almost a year in the time of this review being completed. With two initial albums with plenty of potential, the former Hastings 1066 especially, these Italians showed tendencies of really becoming a band to reckon with someday but they still had some way to go before really lifting off. This newest album though, Jeanne D'Arc (Joan of Arc), is the concept story of the young French peasant woman who supposedly had a vision from God that she would become the savior of the Kingdom of France and forever rid them of the English yoke. Given the title Maiden of Orleans she led the French army on very succesful campaigns but finally she was betrayed, trialed in Rouen and executed, dying the martyr death. And with this magnificent journey through French Middle Ages Thy Majestie thus continue their concept story direction based on historical events. So leaving Hastings behind and skipping closer to four centuries forward in time, to 1428-1431 to be more precise, the band presents this classic theme in a 12 chapter symphonic metal marvel that most certainly will introduce them to way bigger masses. Still musically and lyrically Thy Majestie don't stray far from their original style either even though they have a new vocalist in Giulio Di Gregorio since their previous releases. His delivery is very similar to that of his predecessor but he's got a little more warmness and depth and fits the epic sound very good. Also compared to Hastings 1066, Jeanne D'Arc has a much better production that sets a great atmosphere to the story. It also suffers a more direct approach, has more power metal touches, includes more melodic instalments, feels much more varied and of course contains the most important feature of all- overall better compositions. Even in the more crucial moments where you really want a concept album to deliver it fulfils your desires of that sort very well. As a listener you're really being drawn into the story and you can almost imagine being surrounded by galloping horses and soldiers marching into battle to the beat of the drums, hear the clash of the swords, smell the stench of blood and sweat, feel the winds of destiny blowing in your face as the album moves along. The epic symphonic power metal truly transports the listener through the story both lyrically and musically in ways I honestly didn't think this band had the abilities to carry out. We find symphonic instalments like Rhapsody but held on a much tighter leash, pompousness rivalling Domine, touches of Fairyland in many infectious melodies, progressive US metal style of the Kamelot mark and it's all set free without totally drowning the listener in overdone arrangements and orchestrations. The choruses really have heavy doses of addictiveness, the many epic choirs further enhance the mighty opus feeling and as good as every intro has a very strong goose bump factor. The keyboard playing by Giuseppi Bondi has been given much leeway in the sound and provides a symphonic air that really sets a perfect tone and he's really a very important contributor to the greatness of this album. The collaboration between guitar and keys also function wonderfully and that also can be said about the guitars working more independently. I really like what the axeman duo Santini and Malta are doing here as well. Many good leads, technical extended guitar passages and skilful solos are found throughout and even though it feels very progressive in many aspects it's still very direct and to the point. Truly remarkable work! As a symphonic metal concept album, Jeanne d'Arc thus delivers more than sufficiently and has a material that really makes you want to return to the epic saga over and over again. No matter if the tracks are faster driven ones like Ride to Chinon or Up to Battle, more epic and symphonic ones like Siege of Paris and For Orleans, Thy Majestie are truly right on the spot here. I personally rank this album very high among the most interesting releases of last year and I really urge you who haven't already this symphonic metal gem in your collection to do something about it. Fans of Italian fantasy metal opuses and of concept albums have a really great release and a very promising band to examine.